Medicinal carnitine-derived and dietary-derived malodorous trimethylamine and its non-malodorous metabolite trimethylamine N-oxide were historically regarded as nontoxic. Clinical and toxicological interest has recently arisen because of their potential association with atherosclerosis. We previously reported a human physiologically based pharmacokinetic (PBPK) model for trimethylamine and its primary metabolite, trimethylamine N-oxide, based on reported rat trimethylamine pharmacokinetics. However, rats are poor metabolizers with respect to trimethylamine N-oxygenation, and this species difference was investigated in vitro using substrate depletion rates in rat and human liver microsomes. The current study investigated the pharmacokinetics of deuterium-labeled trimethylamine orally administered to immunodeficient humanized-liver mice transplanted with commercially available human hepatocytes. Trimethylamine N-oxide was extensively formed in vivo in humanized-liver mice, but not in control mice. The experimental pharmacokinetic data of deuterium-labeled trimethylamine and its N-oxide in humanized-liver mice were scaled up for application to a human PBPK model. The human plasma concentration curves generated by the resulting simple PBPK model were consistent with concentrations in humans reported in the literature. The model can also simulate human plasma levels of trimethylamine and trimethylamine N-oxide during treatment with the prescription medicine L-carnitine and in trimethylamine loading tests. The predicted plasma levels were in the ranges that occur under the consumption of daily dietary foodstuff; such levels are associated with few toxicological impacts. The present PBPK model for trimethylamine and trimethylamine N-oxide could estimate daily doses by both forward and reverse dosimetry and could facilitate risk assessment in humans. The levels of trimethylamine and its N-oxide resulting from daily dietary consumption (Al-Waiz et al., 1987; Fennema et al., 2016) and prescribed L-carnitine treatment (Bain et al., 2006) have historically been accepted as nontoxic (WHO, 2006). However, despite previous research that established the safety of trimethylamine and its N-oxide, clinical interest in their safety has recently arisen because of their association with cardiovascular disease (Wang et al., 2011; Koeth et al., 2013; Fennema et al., 2016). To understand the metabolic fate and levels of trimethylamine in Japanese dialysis patients treated with carnitine (Ozasa et al., 2014; Fukami et al., 2015) and in healthy Japanese volunteers following a normal daily diet (Shimizu et al., 2009), we recently reported a simplified physiologically based pharmacokinetic (PBPK) model (or semi-physiological pharmacokinetic model, Shimizu and Yamazaki, 2017). The model was based on reported findings in rats (Nnane and Damani, 2001) and was used to account for human plasma and urinary levels of trimethylamine and trimethylamine N-oxide in loading tests in five male subjects following single oral doses of 600 mg trimethylamine (Lundh et al., 1995). Species differences in drug metabolism and disposition of trimethylamine N-oxygenations between rats or mice (poor metabolizer phenotype) and humans (extensive metabolizer phenotype) are complex issues (Cashman et al., 2004; Bain et al., 2005; Shephard and Phillips, 2010). We demonstrated that flavin-containing monooxygenase (FMO) family member FMO3 (Yamazaki et al., 2014) oxidizes trimethylamine to trimethylamine N-oxide in monkeys and humans (Yamazaki and Shimizu, 2007; Shimizu et al., 2011; Uno et al., 2013). Previously, in vitro elimination rates of trimethylamine mediated by liver microsomes from rats and humans were determined to overcome species differences and to establish a human PBPK model (Shimizu and Yamazaki, 2017). Without consideration of any interspecies factors between in vitro liver clearances (Nishiyama et al., 2015; Yamazaki et al., 2016), the current study uses an allometric scaling method on data from humanized-liver mice to create a human PBPK model for trimethylamine and its N-oxide. We report herein in silico human plasma concentrations of trimethylamine and trimethylamine N-oxide estimated after virtual oral administration of trimethylamine. Reverse dosimetry was also carried out to estimate the exposure required to generate specified plasma concentrations. Pharmacokinetic data from humanized-liver mice were considered relevant for estimating human in vivo trimethylamine and trimethylamine N-oxide plasma profiles. Biomonitoring concentrations of trimethylamine and trimethylamine N-oxide in human biofluids were consequently evaluated using both the previous model (Shimizu and Yamazaki, 2017) and the new human PBPK model, and their usefulness for analyzing toxicological risk are discussed. Deuterium-labeled trimethylamine-d9 hydrochloride and trimethylamine-d9 N-oxide were purchased from Sigma-Aldrich (St. Louis, MO, USA). Severely immunodeficient non-obese diabetic/severe combined immunodeficiency/interleukin-2 receptor gamma chain-deficient (NOG) mice were modified to express a herpes simplex virus type 1 thymidine kinase within their livers (TK-NOG mice) (Hasegawa et al., 2011; Yamazaki et al., 2016). Male humanized-liver TK-NOG mice (approximately 20-30 g body weight) and male control mice (TK-NOG mice with no transplanted human hepatocytes) were used in this study. In humanized-liver TK-NOG mice, at least 95% of the liver cells were estimated to have been replaced with human hepatocytes (from a 35-year-old male, Lonza, Walkersville, MD, USA), as judged by measurements of human albumin concentrations in plasma (Hasegawa et al., 2011; Yamazaki et al., 2016). Mice were allowed ad libitum access to a radiation-sterilized (30 kGy) pellet diet (CLEA Rodent Diet CA-1; CLEA Japan, Tokyo, Japan) and tap water. The experimental use of commercially available cryopreserved human hepatocytes for this study was approved by the Research Ethics Committees of the Central Institute for Experimental Animals (CIEA). All mouse studies were conducted in strict accordance with the Guide for the Care and Use of Laboratory Animals of CIEA and were approved by the Animal Care Committee of CIEA (Permit Number: 11029A). All surgeries were performed under isoflurane anesthesia to minimize suffering. The reagents used in this study were obtained from previously described sources or were of the highest quality commercially available (Shimizu and Yamazaki, 2017). Plasma samples were collected from mice 1, 2, 4, and 7 hr after a single oral dose of trimethylamine-d9 hydrochloride (15.3 mg/kg, equivalent to 8.6 mg trimethylamine/kg). Samples were deproteinized by adding 30 µL of 0.1% formic acid: 15% methanol: 85% acetonitrile (1:3, v/v) followed by centrifugation (4°C, 20,000 × g, 10 min) to obtain a supernatant for liquid chromatography (LC) analysis of trimethylamine and trimethylamine N-oxide. An API 4000 tandem mass spectrometer (AB Sciex, Framingham, MA, USA) was operated in electrospray positive ionization mode and was directly coupled to a Nexera XR System (Shimadzu, Kyoto, Japan) equipped with a hydrophilic interaction chromatography (HILIC) column (Atlantis Silica HILIC Column, 3.0 µm, 2.1 mm × 100 mm, Waters, Tokyo, Japan). The LC conditions were as follows: Solvent A contained acetonitrile and Solvent B contained 10 mM ammonium formate (pH 3.5). The following gradient program was used with a flow rate of 0.4 mL/min: 0-2 min, linear gradient from 90% A to 70% A; 2-3.5 min, hold at 70% A; 3.5-4.6 min, hold at 60% A; and 4.6-8 min, hold at 90% A. Samples (2.0 µL) were infused using an autosampler. The retention times of trimethylamine and trimethylamine N-oxide were 3.6 and 11.8 min, respectively. Trimethylamine-d9 and trimethylamine-d9 N-oxide were quantified using the m/z 69→49 transition and the m/z 85→66 transition, respectively, on the basis of standard curves of trimethylamine-d9 and trimethylamine-d9 N-oxide commercially available. Background levels of non-labeled trimethylamine and trimethylamine N-oxide were also measured by using the m/z 60→44 transition and the m/z 76→58 transition, respectively. The area under the plasma concentration-time curve (AUC0-last) was calculated using the trapezoidal rule up to the last measurable concentrations using non-compartmental analysis in WinNonlin software version 5 (Pharsight Corporation as part of Certara, St. Louis, MO, USA). Simplified PBPK models for trimethylamine (molecular weight, 59.11) and trimethylamine N-oxide (molecular weight, 75.11) consisted of a chemical receptor (gut) compartment, a metabolizing (liver) compartment, and a central compartment and were set up as described previously (Shimizu and Yamazaki, 2017; Miyaguchi et al., 2015), using a value of 96.6 L/hr for the human hepatic blood flow rate (Qh) (Yamazaki et al., 2016). Values of the octanol-water partition coefficient (logP, 0.240 and 0.179), blood-to-plasma concentration ratio (Rb, 0.719 and 0.845), plasma unbound fraction (fu,p, 0.900 and 0.714), and the liver-to-plasma concentration ratio (Kp,h, 0.752 and 0.675) for trimethylamine and trimethylamine N-oxide, respectively, were obtained from our previous report (Shimizu and Yamazaki, 2017). Table 1. Physiological, experimental, and final calculated parameters for humanized-liver mice and human PBPK models for trimethylamine and trimethylamine N-oxide. Physiological parameters such as Kp,h, Rb, and fu,p were assumed to be the same for humans and for humanized-liver mice. The present modeled plasma concentration curves of trimethylamine and trimethylamine N-oxide for humans were verified by comparison with reported median concentrations (and ranges) for five men after single oral doses of 600 mg trimethylamine free base per subject (Lundh et al., 1995). The reported virtual curves generated from scale up from a rat model to a human model (Shimizu and Yamazaki, 2017) are also shown for comparison. Statistical analysis for the plasma concentrations of trimethylamine and trimethylamine N-oxide in control and humanized-liver mice was done using two-way analysis of valiance (ANOVA) with or without Bonferroni post tests (Prism, GraphPad Software, La Jolla, CA, USA). The circles and triangles in Figs. 1A and 1B show the measured levels of trimethylamine-d9 and trimethylamine-d9 N-oxide in plasma from five control mice and five humanized-liver mice, respectively, after oral administration of 8.6 mg trimethylamine free base equivalent per kg body weight. Humanized-liver mice had extensively and significantly converted trimethylamine to its N-oxide 1-4 hr after oral administration (Fig. 1B, p < 0.01), in contrast to the low levels of conversion in control mice (Fig. 1A). Consequently, control mice had significantly higher concentrations of unmetabolized trimethylamine-d9 than humanized-liver mice (p < 0.01) 1-2 hr after oral administration. In mice, a reduction in FMO3 expression has been reported, primarily as a result of downregulation by androgens (Bennett et al., 2013). Observed AUC0-last values for trimethylamine-d9 and trimethylamine-d9 N-oxide in humanized-liver mice were 1.11 nmol·hr/mL and 65.7 nmol·hr/mL, respectively. From the measured concentrations in humanized-liver mice, kinetic parameters such as the absorption rate constant (ka), the volume of the systemic circulation (V1), and the hepatic intrinsic clearance (CLh,int) were calculated for the humanized-liver mouse PBPK model by fitting and are shown in Table 1. By solving the equations that make up the humanized-liver mouse PBPK model, virtual plasma concentration curves were created and are shown in Fig. 1B. These curves were in reasonable agreement with the measured in vivo data from humanized-liver mice administered trimethylamine-d9 (Fig. 1B). Predicted AUC0-last values for trimethylamine and trimethylamine N-oxide in humanized-liver mice after virtual oral administration were 1.49 nmol·hr/mL and 22.9 nmol·hr/mL, respectively, indicating that almost reasonable PBPK modeling was setup for trimethylamine-d9 and trimethylamine-d9 N-oxide in the humanized-liver mice. Estimated and measured plasma concentrations of trimethylamine and trimethylamine N-oxide in control mice (A), humanized-liver mice (B), and humans (C) after oral administration of trimethylamine. The measured concentrations are shown for trimethylamine (circles) and trimethylamine N-oxide (triangles) in mice after single oral doses of 15.2 mg/kg of trimethylamine-d9 hydrochloride (equivalent to 8.6 mg free base/kg) in this study and for humans after administration of 600 mg trimethylamine per subject (70 kg, 8.6 mg/kg) (Lundh et al., 1995). Trimethylamine and trimethylamine N-oxide concentrations were significantly different between control and humanized-liver mice by two-way ANOVA (p < 0.01) with Bonferroni post tests (*). Lines show the humanized-liver mouse and human PBPK model results for trimethylamine (black solid lines) and trimethylamine N-oxide (black broken lines) based on the current humanized-liver mice and human PBPK models, respectively, after virtual single oral doses. In panel C, the gray lines show the results of the previous human PBPK model for trimethylamine (gray solid lines) and trimethylamine N-oxide (gray broken lines) based on a rat PBPK model (Shimizu and Yamazaki, 2017). The plots in Fig. 1C show the reported median values (and range) of trimethylamine and trimethylamine N-oxide in plasma in five male volunteers after oral administration of 600 mg trimethylamine free base per subject (8.6 mg/kg, Lundh et al., 1995). Using an allometric scaling method on humanized-liver mouse parameters without consideration of any interspecies factors between intrinsic liver clearances in humanized-liver mice and humans, a human PBPK model was set up for trimethylamine and trimethylamine N-oxide (Table 1). By solving the equations of the simplified human PBPK model, in silico plasma concentration curves after the virtual administration of trimethylamine were generated and are shown in Fig. 1C. For comparison, the reported plasma concentration curves generated after virtual administration of trimethylamine using our previously established human PBPK model (principally based on rat data) are also shown (gray lines) (Shimizu and Yamazaki, 2017). The present PBPK modeling based on data from humanized-liver mice revealed that the apparent clearance of trimethylamine and trimethylamine N-oxide from human plasma is slightly faster (Fig. 1C) than that generated by the previous model (Shimizu and Yamazaki, 2017). Circulating trimethylamine N-oxide levels in plasma are reportedly associated with atherosclerosis (Wang et al., 2011; Koeth et al., 2013; Bennett et al., 2013). L-Carnitine can be metabolized by intestinal microbiota to trimethylamine, which is absorbed by the gut and further oxidized to trimethylamine N-oxide in the liver (Collins et al., 2016). It should be noted that reported trimethylamine and trimethylamine N-oxide concentrations in humans were taken before and following a loading test using 600 mg of unlabeled trimethylamine. These apparent concentrations were presumably enhanced to an unknown extent by normal dietary trimethylamine (Lundh et al., 1995), because 300 mg trimethylamine reportedly failed to increase the plasma trimethylamine levels in four subjects among five men involved. In the present study, background plasma levels of non-labeled trimethylamine and trimethylamine N-oxide in mice are shown in Table 2. Under the current conditions, plasma levels of non-labeled trimethylamine in humanized-liver mice were significantly lower than those in control mice (two-way ANOVA, p < 0.01); consequently, the primary metabolite, trimethylamine N-oxide levels in humanized-liver mice were significantly higher than those in control mice (two-way ANOVA, p < 0.01), in consistent with the in vivo findings using deuterium-labeled trimethylamine-d9 shown in Figs. 1A and 1B. These analyses revealed that plasma levels of deuterium-labeled trimethylamine-d9 and its metabolite orally loaded in the present study (Figs. 1A and 1B) were in the roughly similar levels to those of non-labeled trimethylamine and trimethylamine N-oxide under the daily dietary intake (Table 2) in both control and humanized-liver mice. Table 2. Background plasma concentrations of non-labeled trimethylamine and trimethylamine N-oxide in control and humanized-liver mice. Values are mean and S.D. (n = 5). Plasma levels of trimethylamine in humanized-liver mice were significantly lower than those in control mice (two-way ANOVA, p < 0.01); trimethylamine N-oxide levels in humanized-liver mice were significantly higher than those in control mice (two-way ANOVA, p < 0.01). We previously reported data showing that plasma concentrations of trimethylamine and its N-oxide in a cohort of hemodialysis patients treated with 300-1,000 mg of L-carnitine were likely in the same range as those of healthy subjects consuming a typical Japanese diet (Ozasa et al., 2014), implying little risk in humans. Under the regimen of three virtual intravenous doses of 354 mg trimethylamine (to correspond to 1,000 mg L-carnitine, 6.2 mmol) per week, trimethylamine and trimethylamine N-oxide were, according to our model, extensively eliminated from plasma into the urine (Fig. 2). In this simulation, the apparent maximum plasma concentration of trimethylamine N-oxide was 183 µM; the mean plasma concentrations of trimethylamine and trimethylamine N-oxide during the treatment were 12 µM and 51 µM, respectively. Using the current simplified PBPK model, the human plasma levels of trimethylamine and trimethylamine N-oxide in trimethylamine loading tests were also considered to be within the range of interindividual variability resulting from daily dietary foodstuff consumption (Shimizu et al., 2009; Ozasa et al., 2014; Fukami et al., 2015). 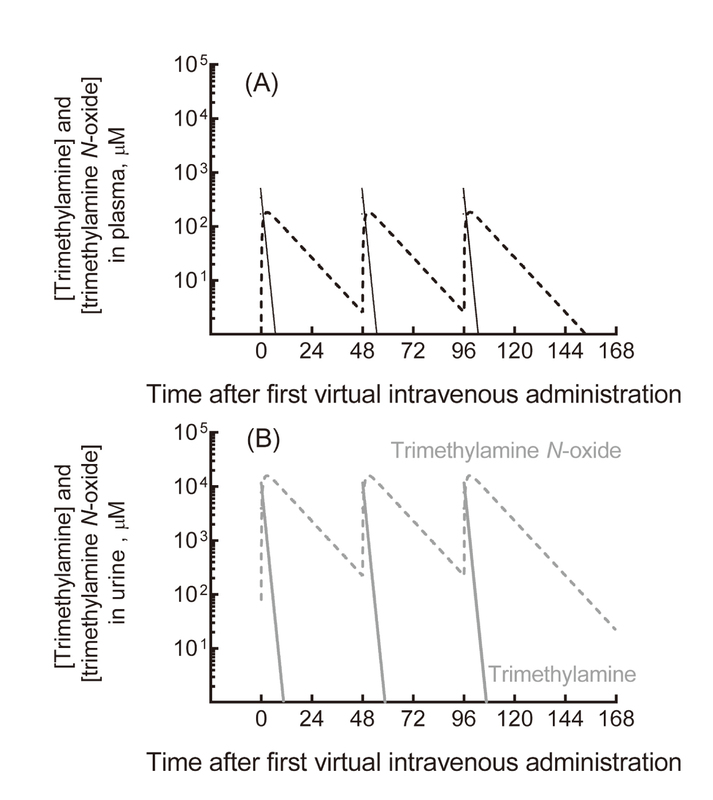 Estimated plasma (A) and urinary (B) concentrations of trimethylamine and trimethylamine N-oxide in humans after a virtual intravenous regime of three doses of 354 mg trimethylamine (to correspond to 1,000 mg L-carnitine, 6.2 mmol) per week. The concentrations of trimethylamine (solid lines) and trimethylamine N-oxide (broken line) are shown in plasma (black, A) and urine (gray, B). The present PBPK model was able to estimate human plasma concentrations of trimethylamine and trimethylamine N-oxide after virtual doses of trimethylamine by forward dosimetry (from doses to concentrations). 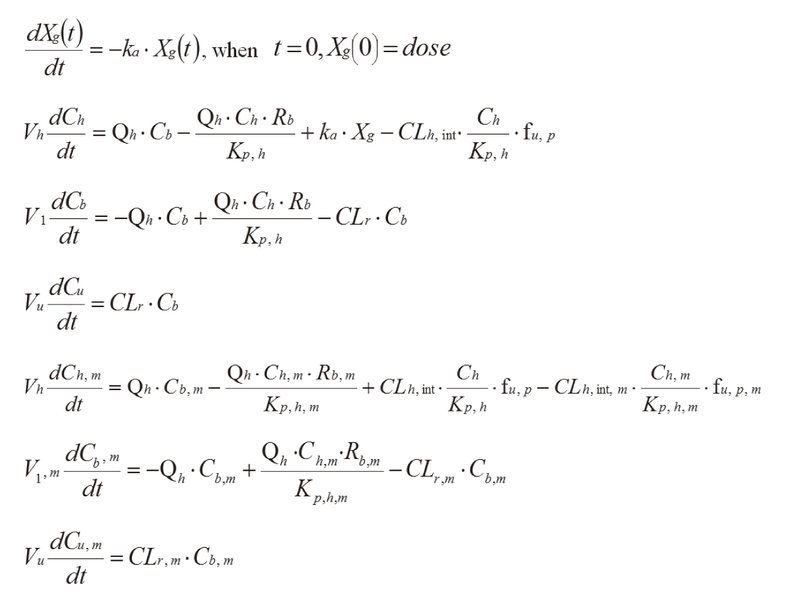 However, the model was also capable of reverse dosimetry, i.e., estimation of the trimethylamine doses required to generate a certain plasma concentration. By reverse dosimetry analysis with the current human PBPK model, the trimethylamine (26 ± 17 µM) and trimethylamine N-oxide (197 ± 100 µM) concentrations previously measured in plasma from 10 healthy Japanese volunteers (Ozasa et al., 2014) may imply exposure to 1,980 ± 1,290 mg trimethylamine/day and 2,200 ± 1,150 mg trimethylamine/day, respectively, assuming that the reported concentrations had reached steady state values (calculated as the area under the concentration curve divided by 24 hr under multiple administrations). Gut microbial metabolism of essential nutrients results in the production of trimethylamine, which upon absorption by the host is converted in the liver to trimethylamine N-oxide (Collins et al., 2016). The members of the human gut microbiota responsible for both the accumulation of trimethylamine and its N-oxide and the subsequent decrease in choline bioavailability to the host have been reportedly identified (Romano et al., 2015). Further understanding of how to manipulate the trimethylamine-producing species in the intestinal microbiota as one of the determinant factors (Cho et al., 2017) in combination with the PBPK modeling could potentially lead to novel treatments for atherosclerosis and associated diseases. In conclusion, in silico human plasma concentrations of trimethylamine and trimethylamine N-oxide estimated using a revised PBPK model after virtual oral doses of trimethylamine were consistent with reported concentrations after non-radiolabeled trimethylamine treatments in human subjects. The previous parameters used for human PBPK modeling were based on the reported trimethylamine disposition in rats; however, the pharmacokinetic data from humanized-liver mice were considered to be a more accurate representation of human trimethylamine and trimethylamine N-oxide metabolic profiles. The present PBPK modeling based on data from humanized-liver mice revealed that the apparent clearance of trimethylamine and trimethylamine N-oxide from human plasma was slightly faster than that generated by the previous model (Shimizu and Yamazaki, 2017). The present results suggested that the forward or reverse dosimetry of trimethylamine and trimethylamine N-oxide using the current simplified PBPK model (based on data from humanized-liver mice) could contribute to human risk assessment of medicinal carnitine-derived and dietary-derived trimethylamine. The authors thank Norie Murayama and Yusuke Kamiya (Showa Pharmaceutical University) and Megumi Nishiwaki and Nao Yoneda (CIEA) for their assistance and David Smallbones for his advice on English language usage. This work was supported in part by the METI Artificial Intelligence-Substances Hazardous Integrated Prediction System Project, Japan and by the Japan Society for the Promotion of Science Grants-in-Aid for Scientific Research 16K08380 (M.S.) and 17K08425 (H.Y.). The authors state that there are no conflicts of interest to declare. Al-Waiz, M., Mitchell, S.C., Idle, J.R. and Smith, R.L. (1987): The metabolism of 14C-labelled trimethylamine and its N-oxide in man. Xenobiotica, 17, 551-558. Bain, M.A., Fornasini, G. and Evans, A.M. (2005): Trimethylamine: metabolic, pharmacokinetic and safety aspects. Curr. Drug Metab., 6, 227-240. Bain, M.A., Milne, R.W. and Evans, A.M. (2006): Disposition and metabolite kinetics of oral L-carnitine in humans. J. Clin. Pharmacol., 46, 1163-1170. Bennett, B.J., de Aguiar Vallim, T.Q., Wang, Z., Shih, D.M., Meng, Y., Gregory, J., Allayee, H., Lee, R., Graham, M., Crooke, R., Edwards, P.A., Hazen, S.L. and Lusis, A.J. (2013): Trimethylamine-N-oxide, a metabolite associated with atherosclerosis, exhibits complex genetic and dietary regulation. Cell Metab., 17, 49-60. Cashman, J.R., Lattard, V. and Lin, J. (2004): Effect of total parenteral nutrition and choline on hepatic flavin-containing and cytochrome P-450 monooxygenase activity in rats. Drug Metab. Dispos., 32, 222-229. Cho, C.E., Taesuwan, S., Malysheva, O.V., Bender, E., Tulchinsky, N.F., Yan, J., Sutter, J.L. and Caudill, M.A. (2017): Trimethylamine-N-oxide (TMAO) response to animal source foods varies among healthy young men and is influenced by their gut microbiota composition: A randomized controlled trial. Mol. Nutr. Food Res., 61, 1600324. Collins, H.L., Drazul-Schrader, D., Sulpizio, A.C., Koster, P.D., Williamson, Y., Adelman, S.J., Owen, K., Sanli, T. and Bellamine, A. (2016): L-Carnitine intake and high trimethylamine N-oxide plasma levels correlate with low aortic lesions in ApoE-/- transgenic mice expressing CETP. Atherosclerosis, 244, 29-37. Fennema, D., Phillips, I.R. and Shephard, E.A. (2016): Trimethylamine and trimethylamine N-oxide, a flavin-containing monooxygenase 3 (FMO3)-mediated host-microbiome metabolic axis implicated in health and disease. Drug Metab. Dispos., 44, 1839-1850. Fukami, K., Yamagishi, S., Sakai, K., Kaida, Y., Yokoro, M., Ueda, S., Wada, Y., Takeuchi, M., Shimizu, M., Yamazaki, H. and Okuda, S. (2015): Oral L-carnitine supplementation increases trimethylamine-N-oxide but reduces markers of vascular injury in hemodialysis patients. J. Cardiovasc. Pharmacol., 65, 289-295. Hasegawa, M., Kawai, K., Mitsui, T., Taniguchi, K., Monnai, M., Wakui, M., Ito, M., Suematsu, M., Peltz, G., Nakamura, M. and Suemizu, H. (2011): The reconstituted ‘humanized liver’ in TK-NOG mice is mature and functional. Biochem. Biophys. Res. Commun., 405, 405-410. Koeth, R.A., Wang, Z., Levison, B.S., Buffa, J.A., Org, E., Sheehy, B.T., Britt, E.B., Fu, X., Wu, Y., Li, L., Smith, J.D., DiDonato, J.A., Chen, J., Li, H., Wu, G.D., Lewis, J.D., Warrier, M., Brown, J.M., Krauss, R.M., Tang, W.H., Bushman, F.D., Lusis, A.J. and Hazen, S.L. (2013): Intestinal microbiota metabolism of L-carnitine, a nutrient in red meat, promotes atherosclerosis. Nat. Med., 19, 576-585. Lundh, T., Akesson, B. and Skerfving, S. (1995): Effect of dietary intake of trimethylamine on human metabolism of the industrial catalyst dimethylethylamine. Occup. Environ. Med., 52, 478-483. Miyaguchi, T., Suemizu, H., Shimizu, M., Shida, S., Nishiyama, S., Takano, R., Murayama, N. and Yamazaki, H. (2015): Human urine and plasma concentrations of bisphenol A extrapolated from pharmacokinetics established in in vivo experiments with chimeric mice with humanized liver and semi-physiological pharmacokinetic modeling. Regul. Toxicol. Pharmacol., 72, 71-76. Nishiyama, S., Suemizu, H., Shibata, N., Guengerich, F.P. and Yamazaki, H. (2015): Simulation of human plasma concentrations of thalidomide and primary 5-hydroxylated metabolites explored with pharmacokinetic data in humanized TK-NOG mice. Chem. Res. Toxicol., 28, 2088-2090. Nnane, I.P. and Damani, L.A. (2001): Pharmacokinetics of trimethylamine in rats, including the effects of a synthetic diet. Xenobiotica, 31, 749-755. Ozasa, H., Shimizu, M., Koizumi, A., Wakabayashi, A. and Yamazaki, H. (2014): Trimethylamine generation in patients receiving hemodialysis treated with L-carnitine. Clin. Kidney J., 7, 329. Romano, K.A., Vivas, E.I., Amador-Noguez, D. and Rey, F.E. (2015): Intestinal microbiota composition modulates choline bioavailability from diet and accumulation of the proatherogenic metabolite trimethylamine-N-oxide. MBio, 6, e02481. Shephard, E.A. and Phillips, I.R. (2010): The potential of knockout mouse lines in defining the role of flavin-containing monooxygenases in drug metabolism. Expert Opin. Drug Metab. Toxicol., 6, 1083-1094. Shimizu, M., Kozono, M., Murayama, N. and Yamazaki, H. (2009): Bonitos with low content of malodorous trimethylamine as palliative care for self-reported Japanese trimethylaminuria subjects. Drug Metab. Pharmacokinet., 24, 549-552. Shimizu, M., Denton, T., Kozono, M., Cashman, J.R., Leeder, J.S. and Yamazaki, H. (2011): Developmental variations in metabolic capacity of flavin-containing mono-oxygenase 3 in childhood. Br. J. Clin. Pharmacol., 71, 585-591. Shimizu, M. and Yamazaki, H. (2017): Human plasma and urinary metabolic profiles of trimethylamine and trimethylamine N-oxide extrapolated using a simple physiologically based pharmacokinetic model. J. Toxicol. Sci., 42, 485-490. Uno, Y., Shimizu, M. and Yamazaki, H. (2013): Molecular and functional characterization of flavin-containing monooxygenases in cynomolgus macaque. Biochem. Pharmacol., 85, 1837-1847. Wang, Z., Klipfell, E., Bennett, B.J., Koeth, R., Levison, B.S., Dugar, B., Feldstein, A.E., Britt, E.B., Fu, X., Chung, Y.M., Wu, Y., Schauer, P., Smith, J.D., Allayee, H., Tang, W.H., DiDonato, J.A., Lusis, A.J. and Hazen, S.L. (2011): Gut flora metabolism of phosphatidylcholine promotes cardiovascular disease. Nature, 472, 57-63.
WHO. (2006): Food additives series: 56, safety evaluation of certain food additives, aliphatic and aromatic amines and amides (report of 65th JECFA meeting). Yamazaki, H. and Shimizu, M. (2007): Genetic polymorphism of the flavin-containing monooxygenase 3 (FMO3) associated with trimethylaminuria (fish odor syndrome): observations from Japanese patients. Curr. Drug Metab., 8, 487-491. Yamazaki, M., Shimizu, M., Uno, Y. and Yamazaki, H. (2014): Drug oxygenation activities mediated by liver microsomal flavin-containing monooxygenases 1 and 3 in humans, monkeys, rats, and minipigs. Biochem. Pharmacol., 90, 159-165. Yamazaki, H., Suemizu, H., Mitsui, M., Shimizu, M. and Guengerich, F.P. (2016): Combining chimeric mice with humanized liver, mass spectrometry, and physiologically-based pharmacokinetic modeling in toxicology. Chem. Res. Toxicol., 29, 1903-1911.